When Aesop penned his fable about a thirsty hero who drops pebbles into a pitcher to raise the water to a sippable height, he was imagining a crow—not an elementary-schooler. And scientists have given real versions of this test to whole flocks of crows and related birds to test their smarts. Now they've turned the tables and given Aesop's test to children. The results are nothing for humans to brag about. By solving one kind of puzzle that stumped crows, though, the kids may have shown how a human mind treats problems differently than a birdbrain. The fable-reenacting corvids I wrote about last year were New Caledonian crows. Faced with a clear tube that held a floating bit of food just below their reach, the crows were able to learn that dropping stones into the water made the food rise closer to their beaks. They learned to choose bigger objects over smaller ones, and to reject lightweight styrofoam chunks in favor of sinking rubber pieces. They also learned that none of these tricks worked in a tube filled with sand instead of water. In a study published this week in PLoS ONE, researchers tested 80 children ranging from age 4 to 10 on tasks that Eurasian jays had faced in earlier studies. They guessed that as children grew older, they would be better able to solve the puzzles. Kids with more developed minds would deduce the relationship between throwing objects into a tube and getting the prize that floated inside. (Rather than a piece of meat, the prize for kids was a token that could be exchanged for a sticker of their choice). The first two tasks were straightforward. In one, kids saw a tube of water and another of sawdust, both with sticker tokens sitting on top. If they learned (over the course of five trials) to drop stones into the water tube and ignore the sawdust one, they passed. In the second test, kids saw one tube of water and a bowl of yellow "marbles." Half the marbles were actually balls of cork. The subjects had to learn to use the marbles to get their sticker token, ignoring the useless cork balls. Between ages 4 and 7, kids were largely able to learn the solutions to these two tasks. This matches the performance of Eurasian jays and New Caledonian crows that took the same tests. It wasn't until children were 8 or older that they solved the puzzles on their first try, outdoing the clever birds. "We were surprised" that it took a kid as old as 8 to consistently outsmart a crow, says senior author Nicola Clayton. Of course, the circumstances weren't exactly equal. The birds were working for highly motivating bits of meat, for example, while the kids could only win stickers. And birds' eyes are right next to their beaks. But kids have hands. The final task was one that the jays in an earlier study had never mastered. Subjects saw three clear tubes. The prize was in the center tube, but only the outer two tubes were wide enough to drop stones into. 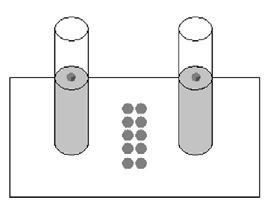 Invisible to the kids or birds, one of those outer tubes was connected in a U shape to the center one. So dropping stones into this tube would make the water in the middle rise too. It's simple enough to get the prize out, as long as you don't get hung up thinking that what you're seeing is impossible. The youngest children were, like the birds, at a loss. But 7-year-olds could learn to solve the puzzle, and kids 8 or older mastered it quickly. When the researchers asked them afterward how the puzzle worked, some of the kids had it all figured out: "The purple one has a connecting pipe," said one 8-year-old. Others had learned the trick without guessing the mechanism: "One tube makes it go higher, the other doesn’t, dunno why," offered a 7-year-old. The researchers who gave Eurasian jays this task—and watched them fail—guessed that the birds couldn't get past the counterintuitive relationship they were seeing. Human kids may have succeeded because their brains approached the problem differently. 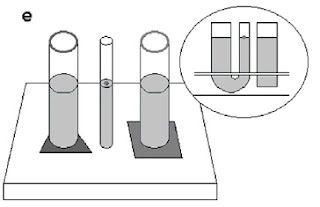 Seeing a clear cause and effect (a stone going into one tube and water rising in another), they could learn to use it to their advantage, even without understanding it. Another possibility is that the kids simply had better hints. When the children first faced the baffling U-tube puzzle, researchers had to prompt them to try something and see what happened. The birds didn't have that advantage. Additionally, only two jays were tested in the earlier U-tube study. They were smart enough to solve the other tasks easily, but it's possible they have cleverer peers somewhere who could have solved the third task as well. "We just don't know," Clayton says. Kids today see impossible-seeming things all the time. A wall switch illuminates an entire room; a Wii controller rolls a bowling ball; Grandma appears in the living room via Skype. It may be, the authors say, that accepting impossibilities isn't a normal stage of human brain development at all. Instead, it might be something humans learn when they grow up in technological societies. "This is a question we would love to pursue," Clayton says. Our familiarity with electronic gadgets might be the only thing giving humans a lead over crows in Aesop's challenges. Until that question is answered, we can hold on to the feeling of slight cognitive superiority for a little while longer. 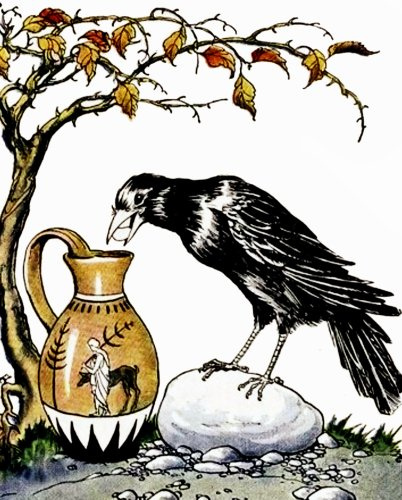 Image: Illustration by Milo Winter for "The Crow and the Pitcher" from Aesop for Children, 1919; uploaded to Flickr by AnnaleeBlysse. Figures from paper by Cheke et al. If they had used candy instead of stickers even the 4 year olds would have figured it out! Crows and kids care more about food they really want to eat than paper with glue on it.